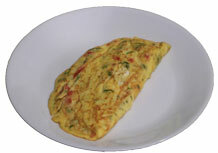 Although they are commonly associated with breakfast in the West, in India an omelet can be eaten anytime. It’s a popular street food and an easy side dish for the traditional rice and chapatti meals. 1) Finely chop the shallots, chilies, tomatoes and cilantro and set those aside. 2) Break the eggs into a cup and beat the yolks and whites. 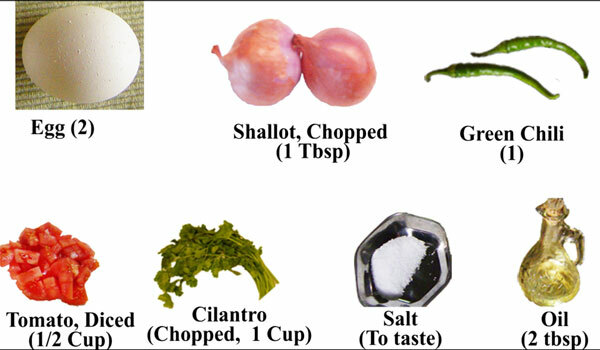 3) Add the tomatoes, the chopped chilies, shallots, tomatoes, cilantro and salt and mix well. 4) To a moderately hot, shallow pan, add oil and when the oil is hot, pour in the eggs. 6) When the omelet turns brown, remove from the pan.